It has been suggested that Lower Congo be merged into this article. (Discuss) Proposed since October 2018. For other uses, see Congo River (disambiguation). The great Congo River (Kongo: Nzâdi Kôngo; French: Fleuve Congo; Portuguese: rio Congo), formerly known as the Zaire River under the Mobutu regime, is the second longest river in Africa, shorter only than the Nile, as well as the second largest river in the world by discharge volume, following only the Amazon. It is also the world's deepest recorded river, with measured depths in excess of 220 m (720 ft). The Congo-Lualaba-Chambeshi River system has an overall length of 4,700 km (2,920 mi), which makes it the world's ninth-longest river. The Chambeshi is a tributary of the Lualaba River, and Lualaba is the name of the Congo River upstream of Boyoma Falls, extending for 1,800 km (1,120 mi). The name Congo/Kongo river originates from the Kingdom of Kongo once located on the southern bank of the river. The kingdom in turn was named for the indigenous Bantu Kongo people, known in the 17th century as "Esikongo". South of the Kingdom of Kongo proper lay the similarly named Kakongo kingdom, mentioned in 1535. Abraham Ortelius in his world map of 1564 labeled as "Manicongo" the city at the mouth of the river. The tribal names in Kongo possibly derive from a word for a public gathering or tribal assembly. The modern name of the Kongo people or Bakongo was introduced in the early 20th century. The name Zaire is from a Portuguese adaptation of a Kikongo word, nzere ("river"), a truncation of nzadi o nzere ("river swallowing rivers"). 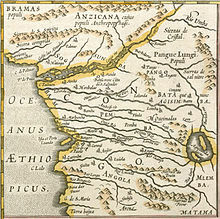 The river was known as Zaire during the 16th and 17th centuries; Congo seems to have replaced Zaire gradually in English usage during the 18th century, and Congo is the preferred English name in 19th-century literature, although references to Zahir or Zaire as the name used by the inhabitants remained common. The Democratic Republic of the Congo and the Republic of the Congo are named after it, as was the previous Republic of the Congo which had gained independence in 1960 from the Belgian Congo. The Republic of Zaire during 1971–1997 was also named after the river, after its name in French and Portuguese. The Congo's drainage basin covers 4,014,500 square kilometres (1,550,000 sq mi), an area larger than India. The Congo's discharge at its mouth ranges from 23,000 to 75,000 cubic metres per second (810,000 to 2,650,000 cu ft/s), with an average of 41,000 cubic metres per second (1,400,000 cu ft/s). The Congo flows generally toward the northwest from Kisangani just below the Boyoma falls, then gradually bends southwestwards, passing by Mbandaka, joining with the Ubangi River, and running into the Pool Malebo (Stanley Pool). Kinshasa (formerly Léopoldville) and Brazzaville are on opposite sides of the river at the Pool, where the river narrows and falls through a number of cataracts in deep canyons (collectively known as the Livingstone Falls), running by Matadi and Boma, and into the sea at the small town of Muanda. Sorted in order from the mouth heading upstream. Downstream of Kinshasa, from the river mouth at Banana, there are a few major tributaries, all on the left side. Upstream of Boyoma Falls near Kisangani, the river Congo is known as the Lualaba River. Although the Livingstone Falls prevent access from the sea, nearly the entire Congo above them is readily navigable in sections, especially between Kinshasa and Kisangani. Large river steamers worked the river until quite recently.[when?] The Congo River still is a lifeline in a land with few roads or railways. The Congo River is the most powerful river in Africa. During the rainy season over 50,000 cubic metres (1,800,000 cu ft) of water per second flow into the Atlantic Ocean. Opportunities for the Congo River and its tributaries to generate hydropower are therefore enormous. Scientists have calculated that the entire Congo Basin accounts for 13 percent of global hydropower potential. This would provide sufficient power for all of sub-Saharan Africa's electricity needs. Currently there are about forty hydropower plants in the Congo Basin. The largest are the Inga dams, about 200 kilometres (120 mi) southwest of Kinshasa. The project was launched in the early 1970s, when the first dam was completed. The plan as originally conceived called for the construction of five dams that would have had a total generating capacity of 34,500 megawatts. To date only the Inga I and Inga II dams have been built, generating 1,776 MW. In February 2005, South Africa's state-owned power company, Eskom, announced a proposal to expand generation through improvements and the construction of a new hydroelectric dam. The project would bring the maximum output of the facility to 40 gigawatts (54,000,000 hp), twice that of China's Three Gorges Dam. It is feared that these new hydroelectric dams could lead to the extinction of many of the fish species that are native to the river. The current course of the Congo River formed 1.5–2 million years BP, during the Pleistocene. The Congo's formation may have led to the allopatric speciation of the bonobo and the common chimpanzee from their most recent common ancestor. The bonobo is endemic to the humid forests in the region, as are other iconic species like the Allen's swamp monkey, dryas monkey, aquatic genet, okapi, and Congo peafowl. In terms of aquatic life, the Congo River Basin has a very high species richness, and among the highest known concentrations of endemics. Until now, almost 700 fish species have been recorded from the Congo River Basin, and large sections remain virtually unstudied. This is by far the highest diversity of any African river system (in comparison, the next richest are the Niger, Volta and Nile with about 210, 140 and 130 fish species, respectively). Due to this and the great ecological differences between the regions in the Congo basin, it is often divided into multiple ecoregions (instead of treating it as a single ecoregion). Among these ecoregions, the Lower Congo Rapids alone has more than 300 fish species, including approximately 80 endemics while the southwestern part (Kasai Basin) alone has more than 200 fish species, of which about a quarter are endemic. The dominant fish families – at least in parts of the river – are Cyprinidae (carp/cyprinids, such as Labeo simpsoni), Mormyridae (elephantfishes), Alestidae (African tetras), Mochokidae (squeaker catfishes), and Cichlidae (cichlids). Among the natives in the river is the huge, highly carnivorous giant tigerfish. Three of the more unusual endemics are the whitish (non-pigmented) and blind Lamprologus lethops, which is believed to live as deep as 160 metres (520 ft) below the surface, Heterochromis multidens, which appears to be more closely related to cichlids of the Americas than other African cichlids, and Caecobarbus geertsii, the only known cavefish in Central Africa. There are also numerous endemic frogs and snails. Several hydroelectric dams are planned on the river, and these may lead to the extinction of many of the endemics. Several species of turtles, and the slender-snouted, Nile and dwarf crocodile are native to the Congo River Basin. African manatees inhabit the lower parts of the river. The entire Congo basin is populated by Bantu peoples, divided into several hundred ethnic or tribal groups (see ethnic groups of the Democratic Republic of the Congo). Bantu expansion is estimated to have reached the Middle Congo by about 500 BC, and the Upper Congo by the first century AD. Remnants of the aboriginal population displaced by the Bantu migration, Pygmies/Abatwa of the Ubangian phylum, remain in the remote forest areas of the Congo basin. The Kingdom of Kongo was formed around 1400 on the left banks of the lower Congo River. Its territorial control along the river remained limited to what corresponds to the modern Bas-Congo province. European exploration of the Congo begins in 1482, when Portuguese explorer Diogo Cão discovered the river estuary (likely in August 1482), which he marked by a Padrão, or stone pillar (still existing, but only in fragments) erected on Shark Point. Cão also sailed up the river for a short distance, establishing contact with the Kingdom of Congo. The full course of the river remained unknown throughout the early modern period. The upper Congo basin runs west of the Albertine Rift. Its connection to the Congo was unknown until 1877. The extreme northeast of the Congo basin was reached by the Nilotic expansion at some point between the 15th and 18th centuries, by the ancestors of the Southern Luo speaking Alur people. Francisco de Lacerda following the Zambezi reached the uppermost part of the Congo basin (the Kazembe in the upper Luapula basin) in 1796. The upper Congo River, known as the Lualaba was first reached by the Arab slave trade by the 19th century. Nyangwe was founded as a slavers' outpost around 1860. David Livingstone was the first European to reach Nyangwe in March 1871. Livingstone proposed to prove that the Lualaba connected to the Nile, but on 15 July, he witnessed a massacre of about 400 Africans by Arab slavers in Nyangwe, which experience left him too horrified and shattered to continue his mission to find the sources of the Nile, so he turned back to Lake Tanganyika. The middle reaches of the Congo remained unexplored from either the east or west, until Henry Morton Stanley's expedition of 1876–77. At the time one of the last open questions of the exploration of Africa (or indeed of the world) whether the Lualaba River fed the Nile (Livingstone's theory), the Congo or even the Niger. 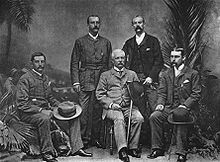 Financed in 1874, Stanley's first trans-Africa exploration started in Zanzibar, and reached the Lualaba on October 17, 1876. Overland he reached Nyangwe, the centre of a lawless area containing cannibal tribes at which Tippu Tip based his trade in slaves. Stanley managed to hire a force from Tippu Tip, to guard him for the next 150 kilometres (90 mi) or so, for 90 days. The party left Nyangwe overland through the dense Matimba forest. On November 19 they reached the Lualaba again. Since the going through the forest was so heavy, Tippu Tip turned around with his party on December 28, leaving Stanley on his own, with 143 people, including 8 children and 16 women. They had 23 canoes. His first encounter with a local tribe was with the cannibal Wenya. In total Stanley would report 32 unfriendly meetings on the river, some violent, even though he attempted to negotiate a peaceful thoroughfare. But the tribes were wary as their only experience of outsiders was of slave traders. On January 6, 1877, after 640 kilometres (400 mi), they reached Boyoma Falls (called Stanley Falls for some time after), consisting of seven cataracts spanning 100 kilometres (60 mi) which they had to bypass overland. It took them to February 7 to reach the end of the falls. 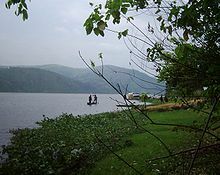 Here Stanley learned that the river was called Ikuta Yacongo, proving to him that he had reached the Congo, and that the Lualaba did not feed the Nile. From this point, the tribes were no longer cannibals, but possessed firearms, apparently as a result of Portuguese influence. Some four weeks and 1,900 kilometres (1,200 mi) later he reached Stanley Pool (now Pool Malebo), the site of the present day cities Kinshasa and Brazzaville. Further downstream were the Livingstone Falls, misnamed as Livingstone had never been on the Congo: a series of 32 falls and rapids with a fall of 270 metres (900 ft) over 350 kilometres (220 mi). On 15 March they started the descent of the falls, which took five months and cost numerous lives. From the Isangile Falls, five falls from the foot, they beached the canoes and Lady Alice and left the river, aiming for the Portuguese outpost of Boma via land. On August 3 they reached the hamlet Nsada. From there Stanley sent four men with letters forward to Boma, asking for food for his starving people. On August 7 relief came, being sent by representatives from the Liverpool trading firm Hatton & Cookson. On August 9 they reached Boma, 1,001 days since leaving Zanzibar on November 12, 1874. The party then consisted of 108 people, including three children born during the trip. Most probably (Stanley's own publications give inconsistent figures), he lost 132 people through disease, hunger, drowning, killing and desertion. Kinshasa was founded as a trading post by Stanley in 1881 and named Léopoldville in honour of Leopold II of Belgium. The Congo basin was claimed by Leopold II as Congo Free State in 1885. The Congo river basin is notable for the lack of bridges crossing the main rivers, although there are a number of ferries available for crossing the great Congo river and the major tributaries. The main reasoning is the mere width of the Congo river and main rivers, and the second is the lack of funds to set up permanent river crossings, this is however slowly changing to the better. The Matadi Bridge, 148 km from the rivermouth, at the port of Matadi in the Kongo Central province. The Kongolo Bridge on the Lualaba River, some 3,900 km along the tributary from the rivermouth, near the town Kongolo, in the eastern province Katanga. The Niangara Bridge on the Uele, some 2,000 km along the tributary from the rivermouth, near the town Niangara. The Dungu Bridge on the Kibali, some 2,050 km along the tributary from the rivermouth, near the town Dungu, at the confluence of Dungu and Kibali rivers, where the Uele river is formed. The Kalimva Bridge on the Kibali, some 2,250 km along the tributary from the rivermouth, near the town Kalimva. Between the towns of Luebo and Tshimpumpu. Near the town of Kananga. At the town of Sanduwa. West of the town of Diongo (also the location of a railway bridge on the Benguela Railway). Mafuambo - Kinganga, some 200 km from the mouth. Near Luozi, some 250 km from the mouth. Kinshasa - Brazzaville, the ferry between the twin capitals - the most busy international ferry connection within Africa. Near Isangi, some 1250 km from the mouth. At Kisangani, some 1500 km from the mouth. Near Bandundu on the Kasai River. At Bandundu on the Kwango River. Near Bandundu on the Bunzili River. At Loange on the Loange River. Near the township of Tshinkenke, in the province of Kasai in DR Congo. Near the township of Mpungu, in the province of Kasai in DR Congo. Uele river crossing at Bondo. Uele river crossing at Malengoya. Uele river crossing at Bambili. On the minor tributaries of the great Congo there are numerous river crossings, which cannot be included here. ^ a b c d e f g Bossche, J.P. vanden; G. M. Bernacsek (1990). Source Book for the Inland Fishery Resources of Africa, Volume 1. Food and Agriculture Organization of the United Nations. pp. 338–339. ISBN 978-92-5-102983-1. ^ a b Oberg, Kevin (July 2008). "Discharge and Other Hydraulic Measurements for Characterizing the Hydraulics of Lower Congo River, July 2008" (PDF). U.S. Geological Survey. ^ Forbath, Peter. The River Congo (1979), p. 6. "Not until it crosses the equator will it at last turn away from this misleading course and, describing a remarkable counter-clockwise arc first to the west and then to the southwest, flow back across the equator and on down to the Atlantic. ^ Anderson, David (2000). Africa's Urban Past. p. 79. ISBN 9780852557617. ^ Manikongo was properly the title of the kings of Kongo; their capital was at the site of modern M'banza-Kongo, capital of Angola's northwestern Zaire Province. Orteilus had no knowledge of the orography of Africa and drew fictitious courses for its rivers; his Congo upstream of its estuary turns sharply south, flowing through what would correspond to Angola and Botswana. ^ Peter Forbath (1977). The River Congo. p. 19. ^ "Monster Fish of the Congo". National Geographic Channel. 2009. Archived from the original on 2010-12-06. ^ The Congo River. Rainforests.mongabay.com. Retrieved on 2011-11-29. ^ a b Alain Nubourgh, Belgian Technical Cooperation (BTC) Archived 2011-09-02 at the Wayback Machine. Weetlogs.scilogs.be (2010-04-27). Retrieved on 2011-11-29. ^ Showers, Kate B. (2011-09-01). "Electrifying Africa: An Environmental History with Policy Implications". Geografiska Annaler: Series B, Human Geography. 93 (3): 193–221. doi:10.1111/j.1468-0467.2011.00373.x. ISSN 1468-0467. ^ Vasagar, Jeevan (2005-02-25). "Could a $50bn plan to tame this mighty river bring electricity to all of Africa?". World news. London: The Guardian. Retrieved 2010-04-30. ^ a b c d Norlander, Britt (20 April 2009). "Rough waters: one of the world's most turbulent rivers is home to a wide array of fish species. Now, large dams are threatening their future". Science World. Archived from the original on 8 July 2012. ^ Leonard C. Beadle (1981). The inland waters of tropical Africa: an introduction to tropical limnology. Longman. p. 475. ISBN 978-0-582-46341-7. Retrieved 2 April 2011. "It is hypothesized that in the late Pliocene or early Pleistocene, a coastal Lower Guinean river captured Malebo Pool, connecting the previously interior Congo Basin to the ocean." Thieme et al., Freshwater Ecoregions of Africa and Madagascar: A Conservation Assessment Ecoregions Assessments, Island Press, 2005, p. 297. ^ Caswell JL, Mallick S, Richter DJ, et al. (2008). "Analysis of chimpanzee history based on genome sequence alignments". PLoS Genet. 4 (4): e1000057. doi:10.1371/journal.pgen.1000057. PMC 2278377. PMID 18421364. ^ Kingdon, Jonathan (1997). The Kingdon Guide to African Mammals. London: Academic Press Limited. ISBN 978-0-1240-8355-4. ^ BirdLife International (2008). "Afropavo congensis". IUCN Red List of Threatened Species. Version 2010.4. International Union for Conservation of Nature. Retrieved 2 May 2011. ^ Dickman, Kyle (2009-11-03). "Evolution in the Deepest River in the World". Science & Nature. Smithsonian Magazine. ^ Freshwater Ecoregions of the World (2008). Sudanic Congo – Oubangi. Archived 2011-10-05 at the Wayback Machine Accessed 2 May 2011. ^ Freshwater Ecoregions of the World (2008). Kasai. Archived 2011-10-05 at the Wayback Machine Accessed 2 May 2011. ^ a b Freshwater Ecoregions of the World (2008). Upper Lualaba. Archived 2011-10-05 at the Wayback Machine Accessed 2 May 2011. ^ Freshwater Ecoregions of the World (2008). Lower Congo Rapids. Archived 2011-10-05 at the Wayback Machine Accessed 2 May 2011. ^ Powell, J. & Kouadio, A. (2008). "Trichechus senegalensis". IUCN Red List of Threatened Species. Version 2014.2. International Union for Conservation of Nature. Retrieved 22 September 2014. Cana, Frank Richardson (1911). "Congo" . In Chisholm, Hugh (ed.). Encyclopædia Britannica. 6 (11th ed.). Cambridge University Press. p. 917. ^ See also Jeal, Tim (1973). Livingstone. New Haven, CT: Yale University Press. Pp. 331-335. ^ Jeal, 2007 pp. 188–219. ^ Jeal, 2007 p. 217. Stanley, Henry M. (1988). Through the Dark Continent. Dover Publications. pp. 432 pages. ISBN 978-0-486-25667-2. ^ Brussels, Monument to Congo pionniers, 50th Jubileum Park.